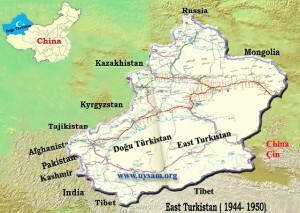 East Turkistan is located beyond a logical boundary of China, the Great Wall. Historically, East Turkistan is a part of Central Asia, not of China. 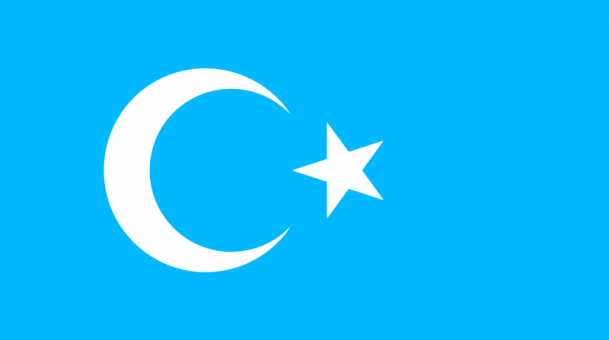 East Turkistan’s people are not Chinese; they are Turks of Central Asia. Uyghurs embraced Islam in A.D. 934 during the Karahanid Kingdom. Kashgar, the capital of the Kingdom, quickly became one of the major learning centers of Islam. Art, the sciences, music and literature flourished as Islamic religious institutions nurtured the pursuit of an advanced culture. In this period, hundreds of world-renowned Uyghur scholars emerged. Thousands of valuable books were written. Among these works, the Uyghur scholar Yusuf Has Hajip’s book, Kutatku Bilig (The Knowledge for Happiness, 1069-1070) and Mahmud Kashgari’s Divan-i Lugat-it Turk (a dictionary of Turk languages) are most influential. The Islamic Uyghur Kingdom of East Turkestan maintained its independence and prosperity until the Manchu Empire invaded the nation in 1876. After eight years of bloody war, the Manchu Empire formally annexed East Turkistan into its territories and renamed it “Xinjiang” (meaning “New Territory” or “New Frontier”) on November 18, 1884. Uyghur power, stature and culture went into a steep decline after the Manchu invasion. Heavy-handed state repression of all activities associated by the Chinese government with “Separatism” has created a dire human rights enviornment for the Uyghur Muslim minority population of northwest China. Beijing has for more than a decade claimed to be confronted with “religious extremist forces” and “violent terrorists” in Xinjiang Province, a vast region one-sixth of China’s land area. A handful of small-scale explosions aimed at government targets over the past decade have been repeatedly invoked by the Chinese government, particularly since September 11, in support of its strike-hard campaign to crack down on separatism and terrorism. In policy pronouncements for both domestic and international audiences, the government has sought to establish that all separatism is tantamount to Islamic terrorism, and in fact uses the terms interchangeably. The state’s efforts to extinguish the common desire among Uyghurs for autonomy or outright independence appear to have increased the alienation of the population and, some analysts speculation, the potential for future violent conflict.